The East Bay Judo Institute was originally founded as the Berkeley Judo Club in the early 1960s by a group of local Judo enthusiasts. During the first few years of the club’s existence, instructors were brought from Japan to teach. Unfortunately, as it was difficult for any one instructor to stay and make a living while teaching Judo, the Berkeley Judo Club saw different head instructors come and go in the first few years. When the club was founded, it was located on University Avenue in Berkeley. Around 1970, the club moved to Solano Avenue in Albany, maintaining the original name. Takayuki Kawakami was the head instructor at this time and remained so for 10 years until he moved in 1981. During those years, the club was stable and strong and a member of the Central Coast Judo Association. With the departure of Mr. Kawakami, the club was again left without a head instructor. From 1981 to 1983, several visitors aided in teaching at the club, which consisted of only a small core of students. In late 1983, the Berkeley Judo Club asked David Matsumoto to become its head instructor. In March of 1986, the club moved back to Berkeley, and was located on Sacramento Avenue near Ashby Avenue. In January of 1991, however, the club moved to its present location in El Cerrito on San Pablo Avenue. 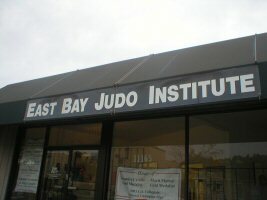 With this latest move, the club changed its name to “East Bay Judo Institute.” With students from all over the San Francisco Bay Area, this name more adequately reflects the size and scope of the club. In the fall of 1993, the club became a member of the Daiheigen Judo Yudanshakai. In January, 2015, David Matsumoto resigned his position of Head Instructor after 31 years of amazing service to EBJI and judo as a whole. Dan Israel assumed the role of head instructor, and the club continues to move forward with Matsumoto Sensei remaining involved as an instructor and program advisor. Today, East Bay Judo Institute is one of the leading schools of judo instruction in the United States. The instructional staff includes many current and former national champions. Members of the East Bay Judo Institute have participated in events all over the world including the World Championships and Olympic Games. What is the emphasis at EBJI? The East Bay Judo Institute (EBJI) is one of this country’s leading centers dedicated to the teaching of Kodokan Judo. Classes emphasize personal development via technical training, over and above results in competition. Training is conducted in a classical Japanese manner, and students learn important rules of etiquette and behavior in addition to Judo techniques. It is the goal of the EBJI for students to develop their minds and characters, as well as their bodies, through training in Judo. The development of perseverance, modesty, and respect for others are the aims of Kodokan Judo and of the EBJI. Judo, translated literally as “the gentle way”, is a martial art that originated in Japan. Its founder, Jigoro Kano, was a teacher in Tokyo and a Jujitsu expert. Jujitsu included many of the forms of combat used by medieval Samurai. Because Jujitsu was constructed primarily of combat techniques, it was generally very dangerous and potentially fatal to its victims. In the early 1880s, Kano sensei attempted to modify or eliminate the dangerous Jujitsu techniques, and created a new discipline, which he called Judo. Although Judo does not appear gentle to the observer, it is gentle in the sense that it does not include the most dangerous techniques of Jujitsu, and that its techniques are most effective when one “gives in” rather than fights an opponent. The end result is the accomplishment of a goal with maximum efficiency and minimum effort with the development of harmony and trust among people. Today, judo is practiced worldwide. While there are many forms of karate, there is only one recognized form of Judo. Its students learn an art, a science, a sport, and a form of self defense. From Kano sensei’s humble beginnings – his first dojo included only 12 tatami mats – Judo has grown to be one of the world’s safest and widely practiced martial art activities.